Day 37: Construction, lots still to do! Today is our last day with Lyndie helping us with our puppets, so it was important to try and get as much done where possible. After doing a lot of body work on our previous construction day, today was all about the face for me. I began with adding some wadding to the paper head as a base and overlaid this with cheese cloth, using a combination of layering wadding under the cloth and stitching I created some lips and sewed in some small foam ears. I intend for my puppet to be an older female so I also stitched in some wrinkles, and allowed the cheese cloth to sag in places to give the impression that some of the elasticity from the features has gone, once I had most of the features in place I selected some eyes and glued them in. I shaped the limbs a little more, and adding some more fullness to the puppets chest. I added in some weight into each breast, which has helped enhance the movement of the puppet; a suggestion for Tim. I then started playing with hair of the puppet, I see her as a washed up/ washed out mermaid with legs. I selected some silvery grey/blue/green strands for her hair with also a few copper strands to give the hair some glamour. I’ve pinned the hair to the head but still need to sew it in. I began to explore costume ideas; however I didn’t get very far. I found some glittery green velvety fabric that I might use to create some kind of foot wear for her (I did think of a dress at first; but it just seems a bit too glam). I also found a piece of white silk which already looked like a dress, its thinness as tattered appearance works quite well with the body of the puppet but no final decisions have been made yet; I’ve still got a lot of work to do! Today we met Liz Walker; Puppeteer and Maker (Formerly of Faulty Optic). We warm up our bodies playing with tension and our body in relation to the ground, everything relates back to the puppet, and gently warms our puppet brains. 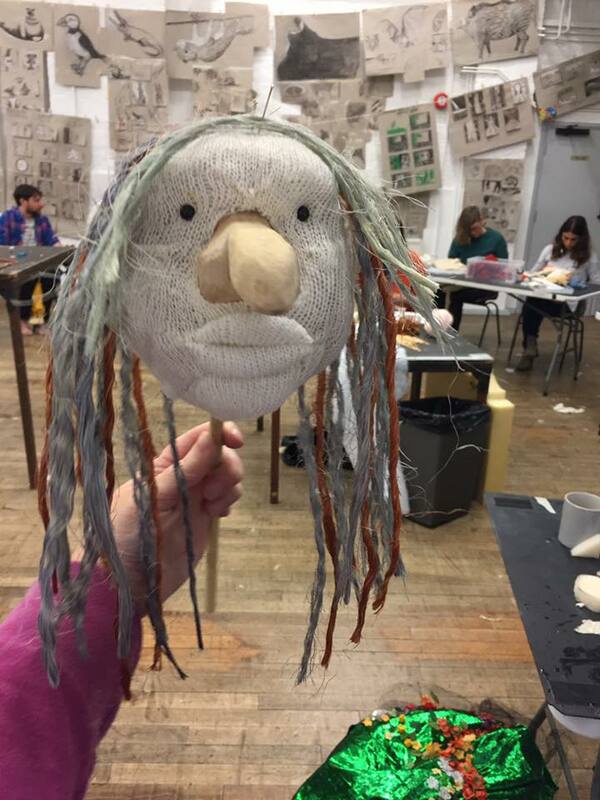 Liz gives us some puppet heads which we attach to bin bags to create their bodies; we bring the puppets to life in pairs, we create a sequence; bringing them to life, building the character, then interacting with another puppet, then the puppets interact with objects. The puppets then pair up and are given one new object to discover; the object has its own manipulator. We play with the relationship of the puppets and the object (Not all puppets like to share). We formalize this interaction and present them to the group. These puppets made from just a head on a stick and a bin bag are so expressive, the tension of the bag helps to convey character; bags pulled taut are high status tall overseers, ones left loose are lower status and more relaxed. The status of the characters alters as the puppets play helping to give us a clear understanding of the relationship between the two characters. We then get to play with the puppets we have made with Lyndie; walking them around finding how they move. Liz presents us with a piece of writing from Daniil Kharms: “Incidences” called “Four illustrations of how a new idea disconcerts a man unprepared for it”, we use two of our own puppets, a piece of paper and a paintbrush. The two puppets play a number of different characters and use the two objects provided. There is an Artist, a writer, a chemist and a composer, when each character enters they demonstrate their career/skill and are harshly criticized by the other puppet. It’s lovely to have the freedom to explore our puppets, now that most of them are nearly finished, and get to figure out the kinds of characters they are/ can be. Day 39: Rituals, introductions and devising. Day 40: Puppet gym, what kind of Puppeteer? 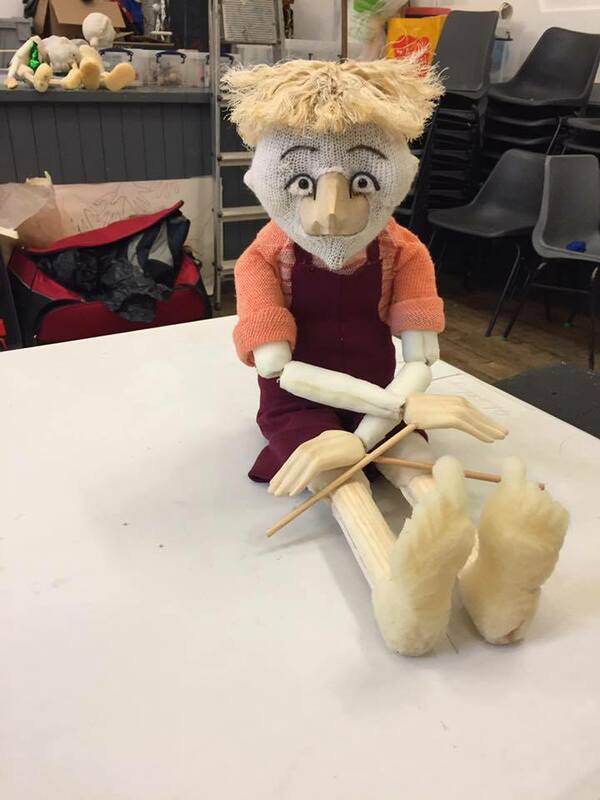 We begin by having a puppet gym; every group had specific moments with in their piece that they wanted to refine, as a whole group we look for solutions. Ways for puppets to spit, hit invisible and visible walls, run in midair, sing, become a crowd mixed up and how can the separate. Once we have found sufficient solutions, we go back to our groups to carry on the work from yesterday. We perform a rough draft, and get some feedback and discuss what we want to alter and explore more. We play with the space and with the pacing of the sections within the piece and as performers we get more involved to help highlight moments. Once we have presented again to the other groups, it’s suggested that maybe we should all switch places, and perform another group’s piece. This is very interesting, we understand the barebones of the performance, but we don’t have the precision of it, and you gain a real respect for what they have created. Watching our own piece reenacted is really useful; they find solutions to problems we had with positioning etc. 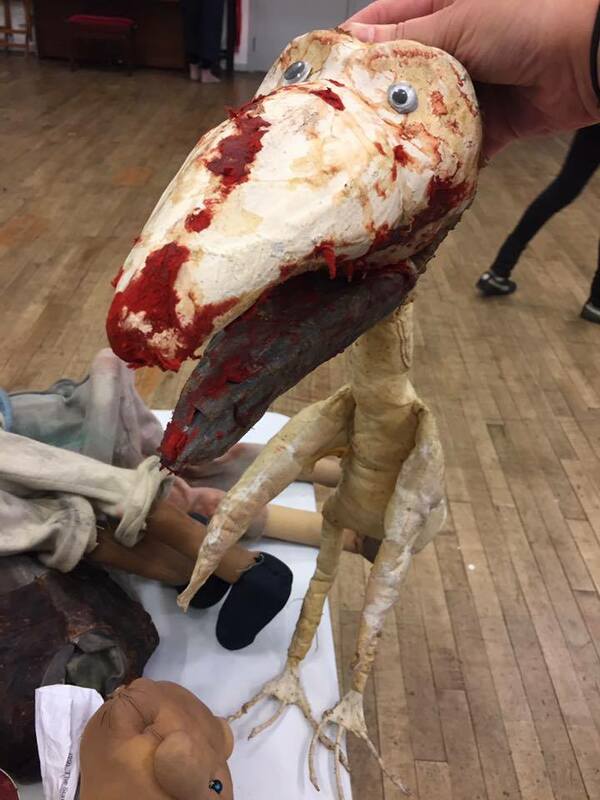 It also helps to highlight the role of the puppeteer, and brings it into question; are they invisible, commenting, visible or something else entirely? Some of the performances become more caricatures of the puppeteers and not really about the puppets; highlighting for me the importance of having an outside eye, and knowing the puppeteers role; all roles are valid, but you need to know which one they are in order to know where the focus for the audience is. Today we explored a number of different shadow performance techniques. There are five different areas to explore each with a separate facilitator. Marty Langthorne: using a light box, coloured gels and other semitransparent materials creating different effects and projecting live onto a screen. Liz Walker; using sheets of clear Perspex and paint projecting live to a screen, creating different effects and images with colour, and different utensils. Sarah Wright; Using slide projectors; painting and scratching onto slides, overlaying them and playing with smaller screens closer to the projectors and having the projectors manipulated so an image could move and come into focus. Stephen Tiplady; Using overhead projectors playing with the body in light on screen and images projected, this also involved playing with different materials to create different effects e.g. oil and sand. Lyndie Wright and Tim Sykes; Using a shadow play board, using traditional shadow puppets, and 3d figures, playing with light; creating different effects with reflective surfaces and different kinds of light and playing with the scale of characters. We all managed to four out of these five techniques today. What a feat of organization to have everything running all at the same time. It was a most enjoyable and messy day. I really enjoyed being allowed to just play with the different techniques and make discoveries. I can see me coming back to this kind of work in the future, and combining it with other forms of puppetry and animation. We began today by doing the fifth shadow technique, and then Stephen Tiplady gave us a demonstration of using the body in shadow; on a large shadow screen playing with distance and movement. From this we then split into two groups, one group sent to the Museum of childhood while the other stayed to create something using the techniques we had explored, and then swapping. We had to create a nine minute performance using any or all of the techniques were given a poem to use as inspiration, we quickly broke down the poem to three sections; Calm, chaos and creation and got to work, trying the techniques we felt fitted these words the best. We used the overhead projector with oils, the Perspex and paint, the lightbox and gels, and a body in shadow (a puppet). Once we had found something that represented each word we moved on to the next. We played at overlapping and combining the projections which was very effective. I focused on using the paint to create chaos, picking up from a colour used in one of the other sections I mixed up some red/orange and starting from that colour (which was breaking the rules because we had always been starting from black when using the paint) I began to add dollops of red and green paint and squash them between two pieces of Perspex, which begins to create organic shapes that look similar to blood vessels and if you manipulate the top layer of Perspex these vessels appear to move; like blood flowing through veins and the heart beating. The whole performance was then quickly rehearsed and choreographed by Stephen, and music was added by Sarah, then we were ready to show each other our work. The pieces were beautiful, and although based on the same poem, were very different, it was nice to see the other groups response to the poem, both were very strong, complex and interesting pieces; amazing for an hour and a half’s work.